Stroke is the top cause of long-term disability in Singapore. Find out more about symptoms of stroke and importance of early treatment. 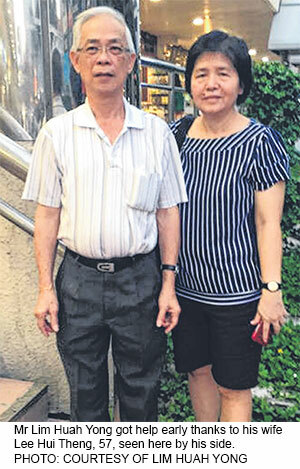 The sudden incapacitation occurred one Sunday morning while Mr Lim Huah Yong, 68, was having coffee with his wife at a McDonald’s outlet in Bugis Junction. “She asked me if I wanted black or white coffee and, at that moment, she said my face changed. I was slumped in my seat and I could not respond at all,” he recalled. He had suffered a stroke, a sudden blockage of blood flow in his brain caused by a clot in a blood vessel. Realising that something was not right, his wife went to get help. Thankfully, there was a big event at the mall and an ambulance was there on standby. Mr Lim made it to hospital very quickly and was given a clot-busting drug soon upon arrival, which would limit the damage caused by the stroke. Fortunately, Mr Lim did not lose the contract, as he was able to talk to the other party after the meeting. Nowadays, his wife accompanies him when he is out and assures him that things are good. And while he is often deeply frustrated that he has trouble communicating, he knows it could have been worse. Many other stroke victims have a worse outcome because they do not get help in time. When the stroke happened, Mr Lim, whose risk factors included high blood pressure, high cholesterol and previous heart disease, could not understand what his wife was saying or express himself, said Associate Professor Deidre Anne De Silva, a senior consultant at the department of neurology, National Neuroscience Institute. But he managed to get help early, as his wife alerted the Singapore Civil Defence Force team, who then called the hospital, where a stroke team was activated. One of the problems that prevent more than half of stroke patients from being seen early is a lack of familiarity with the symptoms. “It could be the slurring of speech which may not be associated with face drooping. The person may be speaking but it’s slurred so he sounds like he’s drunk,” said Prof De Silva, who is also the chair of the Ministry of Health’s Stroke Service Improvement team. Some people have the mistaken belief that you need to experience a combination of symptoms for it to be called a stroke. “It can be purely speech, with the face and limbs looking fine. That’s why it’s very important to tell people that it’s not always a combination of signs,” said Prof De Silva. According to the Ministry of Health, cardiovascular disease, such as heart disease and stroke, accounted for nearly one in three deaths in Singapore last year. Patients have to be treated with a clot-busting drug within 4 1/2 hours of experiencing symptoms of ischaemic strokes, which account for 85-90 per cent of all strokes. The drug opens blocked blood vessels and restores blood flow to the brain, to limit damage done to the brain from the lack of oxygen. A mechanical thrombectomy, an interventional treatment that has a window of six to eight hours, is used to remove clots that block large blood vessels, if applicable. The other type of stroke is a haemorrhagic stroke. It is caused by a rupture in a blood vessel within the brain. Symptoms develop rapidly and in an aggressive manner. At the hospital, checks can take up to an hour so stroke patients need to get to hospital within 3 1/2 hours of experiencing symptoms. Here, ambulances can get patients to hospitals quickly. Yet many do not make it. Some patients will take a nap and hope to feel better while some turn up at hospital days later not realising they had suffered a stroke, said Prof De Silva. “Some elderly patients will take Panadol or put koyok (medicated plaster), or wait for their son or daughter to return from work first.” There are also those who go to the polyclinic or a general practitioner, she said. Stroke patients who seek help late come from all segments of society, she said. And even if one is late, it is still imperative to seek help as quickly as possible to prevent getting another stroke. According to a recent statement from the charity organisation Stroke Support Station, only 6 per cent of ischaemic stroke patients here received the clot-busting drug in 2013. And, 55 per cent of patients arrived more than 12 hours after the first onset of stroke. Associate Professor Vijay Kumar Sharma, a senior consultant at the neurology division of the National University Hospital (NUH) said that in the past decade, at NUH, just under 20 per cent of stroke patients were able to be treated with the clot-busting drug. Still, that was an improvement over the 0.5 per cent who received the tissue plasminogen activator, or tPA, more than a decade ago. Stroke is the top cause of longterm disability in Singapore. “A very good proportion of stroke patients also end up with some memory or cognition impairment. It’s not a major disability but it can get worse with time,” said Prof Vijay. “The deficits depend on the part of the brain that’s affected. We want to save as much brain tissue as possible,” said Prof De Silva.